I woke up today and the sun was shining, and I’d like to think I had something to do with with it. Internet radio is still standing, at least for now. Months ago I signed a petition to save internet radio, sent emails to my congressman, performed ritual rain dances in hopes that I could always listen to one of my favorite internet radio “stations”, Pandora. This morning I am happy to report that my Explosions in the Sky station is working just fine. SoundExchange is the first organization in the U.S. designated to collect performance royalties for sound recording copyright owners and featured and non-featured artists. (SoundExchange faq). A payment scheme of per-channel minimum fees, which would effectively have crippled small and non-commercial webcasters, was being sought by the Copyright Royalty Board. 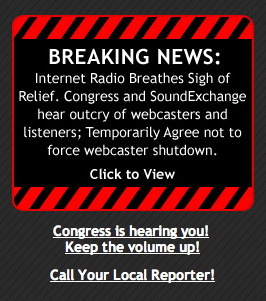 SoundExchange’s decision not to enforce new royalty rates, which were due to go into effect Sunday, does not mean Internet radio is saved. Far from it. 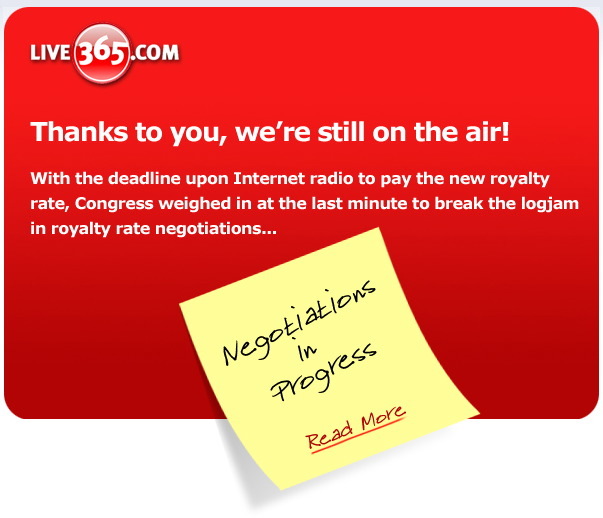 Negotiations must continue in good faith and result in a workable royalty rate. And those pesky Congress folks will be looking over the shoulders of all parties involved. Kind of reminds me of Major League Baseball’s labor negotiations. Tim Westergen of Pandora, and others, have said this reprieve is due in large part to small and non-commerical Internet radio listeners and the activist efforts such as savenetradio.org.